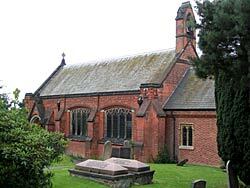 St Peter's church, Awsworth was originally built in 1746 and enlarged in 1902-3 (photo: A Nicholson, 2004). AWSWORTH is one of those Cinderella-like villages which have suffered undue neglect at the hands of the local historian. Thoroton devoted part of a page to it under the name of Aldesworth, but subsequent writers have been even less generous. It possesses no venerable church or other archaeological remains of interest, mid the charm of its coal pits, blast furnaces, canal, and long railway viaduct have failed to appeal to chroniclers of our time. It was probably a Saxon settlement and its early name, Ealdeswyrthe, denotes its origin as the "worth" or farm of a person called Kald, a not unusual personal name in Saxon days. Gradually the initial " E " was dropped, at a very much later era the "I" slipped out, and the present spelling was evolved, though the "I" persisted far into the 18th century. Its last Saxon owners were Alwin, who had a manor, and Ulchcte, who, under the Confessor, owned various manors in this district and had here half-a-caracute of land. Burton Priory had for half-a-century held some of its land, but after the Conquest little was heard of it. King William retained the soil, placing it under the care of William Peverel, but it was of little value, for in 1086, when Alden was its tenant, much of it lay waste. One of Lenton Priory's early benefactions consisted of the land which Robert de Radford held, and when a dispute arose with respect to the mill, the Cluniac monks settled it by accepting a yearly rental of 12d. 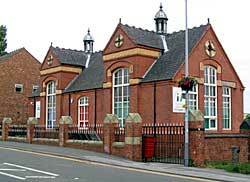 Victorian Infants School at Awsworth (photo: A Nicholson, 2004). The custody of these lands soon passed into an overlordship which was lost by the last of the Peverels when Henry II became king in 1154. Peverel had fought for Stephen and was accused of causing the death of the Earl of Chester by witchcraft or poison; in any event he disappeared—taking the cowl and hiding himself in a monastery it is said—and Henry bestowed his forfeited estates upon his son, the future King John. By then Lenton Priory had extended its interests in Awsworth, and was receiving a mark yearly from the land of Adam de Aldesworth. The Aldesworths were local landholders until the 15th century, when they seem to have removed to Nottingham, but in the latter part of the 13th century they were sharing the lordship with the Belle Aquas (Bellews) both holding from Ralph de Cromwell as overlord. Under Edward III, the Bella Aquas gave their part to the Sallows (who had various manors in and around Edingley and Hallam) and in 1428 the old Aldesworth possessions passed to John Broxtowe and others. This was one of the places which, benefited from the bequest in 1430 by Sir Nicholas Strelley to poor folk who neither played unlawful games nor frequented taverns at unlawful hours by night, and that it was well wooded may be inferred from the record that about that time it supplied stout timber for the repair of "the Bryges" at Nottingham. A few years earlier John Broxtowe had left his mansion here with Dyot Meadow and other lands, together with larger possessions at Kirkby Woodhouse to the priories of Newstead and Lenton, but as no licence had been obtained and the bequest violated the Mortmain Act, the gift was declared invalid and the properties were impounded by the Crown. The capital messuage and lands were let on lease for 12 years, but in 1455 Henry VI granted that at the expiration of the tenancy they should revert to Broxtowe's executor and that the intentions of the testator should then be carried into effect. By that time, however, the Yorkists had triumphed over the Lancastrians and in 1461 Edward IV granted the said properties to Richard Illingworth. When the soldiers of the Wars of the Roses laid down their swords the lawyers took up their quills and a long series of lawsuits began. Some were, in effect, for verification of titles, but others were attempts to seize property, Illingworth made good his title to the Broxtowe grant to Newstead and Lenton, but the Pilkingtons were hard put to it to defend their acquisition of the old Bella Aqua estate, and in 1468 Geoffrey Pilkington and his heiress wife, a Marmion, were suing John Squyer for a chest of deeds relating to the manor of Aldesworth. About 1504 Elena Delves brought lands here by marriage to Sir Robert Sheffield, and after her husband's death the Earl of Shrewsbury was alleged to have seized the Awsworth and other properties of the infant heir. Various documents of a little later date tell of apple orchards, meadows, pastures, and enclosures called "le breych" and "rawrydding," tenanted by the vicar of Ilkeston, Lady Clinton, Richard Wylkynson, Roger Nykson, John Bachelor and others, and disclosed the fact that Felley Priory had acquired here a parcel of land. The suppression of the monasteries, which occasioned a great economic upheaval elsewhere, had little effect in Awsworth, for the holdings of the monks were small. Newstead's expectations had not fructified; Lenton's interest amounted only to 13s 4d. a year, and that of Felley but to 2s. 4d. As there was no church in the village, there were no advowson squabbles: the inhabitants parished at Nuthall until the middle of the 18th century. According to tradition, Anne Ayscough (or Askew), the martyr, spent part of her early life at Awsworth, and it is said that she was born at Nuthall, where her father was lord of the manor. Her story belongs to that parish, but it may be mentioned in passing that she was burned at Smithfield in 1546, at the age of 25, and that her friendship with Catherine Parr, the 6th and last queen of Henry VIII, caused that monarch to make trenchant remarks about his wife's association with such a protestant. Within little more than a decade after her martyrdom the faith for which she died was established throughout the realm, and an Awsworth man left "ten shillings to the church of Nuthall, to be bestowed upon the makinge of two stooles or seats " for the use of his old neighbours when they came to worship in accordance with the new doctrine and ritual. In Elizabethan times the Babingtons held part of Awsworth; and when Anthony Babington was executed in 1587 for his share in the plot to murder "Good Queen Bess" and place the Romanist Mary, Queen of Scots, upon the throne, his possessions escheated to the Crown, but Elizabeth graciously permitted the conspirators brother to succeed to part of his estates. 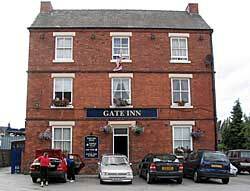 The Gate Inn, Awsworth (photo: A Nicholson, 2004). A generation afterwards glass-works were established in the village "near the coal-pits." Similar works had recently been founded at Wollaton in an attempt to repair the fortunes of the Willoughbys, consequent upon the costly erection of Wollaton Hall and family extravagances. Old Ordnance Survey maps show that these works were situated close by the site of the present railway station, and they were maintained to at least the end of the 17th century and probably later. An official document of 1621 states that there were then 4,000 persons engaged in making or transporting glass, and that glass-works with furnaces existed in London, Milford, Notts., and Newcastle. Seventy-two years later there were 88 glass-making works in the "kingdom, including one here, another near by, and at Nottingham. The "Loyal Duke" of Newcastle had property here which was seized by Parliament during the Civil War but at the Restoration he recovered it in whole or part. In 1661 it was certified that he had 64a. of land here and at Babington Moor, worth £32 12s. a year, and lands of double that value in which he had a reversionary interest. About the time of Anne the lordship was divided between the Willoughbys of Risley and the Ayscoughs of Nuthall. In 1744 came the bequest of Rd. Smedley for the teaching of poor children, with the curious stipulation that none should benefit thereby who were unable to play battledore and shuttlecock; it was not to be a creche! The church was erected in 1760 or perhaps a little earlier, the living being a perpetual curacy. In 1749, £300 was received from the Queen "Anne Bounty Fund for the curacy, and additional £200 coming from the latter source by lot in 1793 for its augmentation. At the end of that century Awsworth was "a small hamlet" with "much boggy land" and the Marsh was a common with a few scattered buildings, in the possession of Lord Melville, "who, with the Duke of Rutland and Lord Stamford, were the owners of the land." The bogs were doubtless the land that was waste when Domesday Book was compiled. By 1885 this was "a rapidly increasing village in the civil parish of Nuthall, possessing a board school of its own and a station of the Gt. Northern Railway, which here joins the Pinxton Branch and passes over a lofty viaduct 580 yards long, and brickmaking had become a local industry. In 1894 it it became itself a civil parish and the age-long link with Nuthall was broken.